Hvis der er noget der er skrevet side op og ned om, så er det sund mad. Desuden hvad er sund mad? Opfattelsen af sund mad ændrer sig hele tiden. Hvad der var sundt for blot nogle få år tilbage er måske ikke engang sundt i dag. Så hvordan ved man egentlig hvad der er sund mad? Jeg har tre grundprincipper til mad, som jeg kalder SEB-princippet. Det skal være Etisk forsvarligt. Igen hvad er sundt mad. Der findes mange sundhedsguruer og forskning på området, og jeg har læst mange af dem. 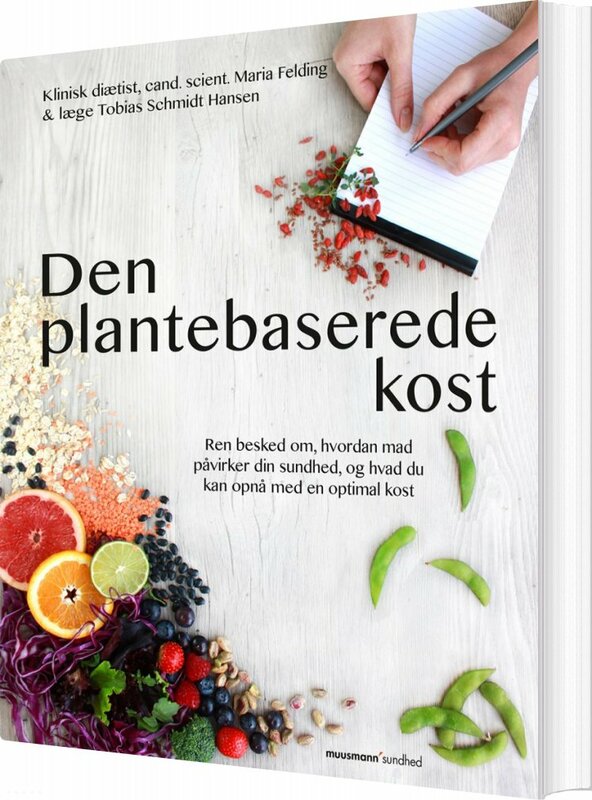 Den bedste og klogeste bog jeg til dato har læst er bogen, “Den plantebaserede Kost” af Maria Felding og Tobias Schmidt Hansen. Den er meget forskningsbaseret og dermed troværdig. Kort og godt handler det om at ens kost så vidt muligt skal være plantebaseret. Dermed menes, at det skal være gode friske naturlige (helst økologiske) plantebaserede råvarer, der ikke må være for forarbejdede. Hvis du spiser varieret indenfor hele farvepaletten af frugt, grønt, bær og nødder, så vil din fysiske og mentale sundhedsniveau blive hævet væsentligt. Etisk mad er mad der er produceret forsvarligt og med respekt overfor organismen, der skal blive fødekilde. Det gælder naturligvis mest kødprodukter som grise, køer og kyllinger. Jeg har svært ved at forstå, at man kan spise dyr, der er blevet masseproduceret og som har levet et forfærdeligt liv, bare for at vi skal mæske os i deres billige kadavere. Hvis jeg endelig en gang i mellem skal spise kød, så skal det ihvertfald være fra økologiske dyr. Bæredygtig mad er mad der primært er klimavenlig. Dvs. at her er det endnu en god grund til at fravælge kød, da kødproduktion er meget mere energikrævende end planteproduktion og kødproduktion udleder mange gange flere tons drivhusgasser ud samlet set end planteproduktion. Derudover er det også vigtigt at spise så lokalt som muligt. Fx bør man ikke købe Pink Lady fra Chile, når man kan købe både danske, tyske og hollandske æbler, også om vinteren. Desuden er de frugter og grøntsager, der er transporteret over større afstande tilført forskellige kemikalier, så de kan holde sig længere. Summa summarum: Køb plantebaserede lokale økologiske fødevarer. Has Love Come To Your Town? Din Selvhelbredende krop 19 – Optimist eller pessimist? Do You Need A Good Morning Routine? 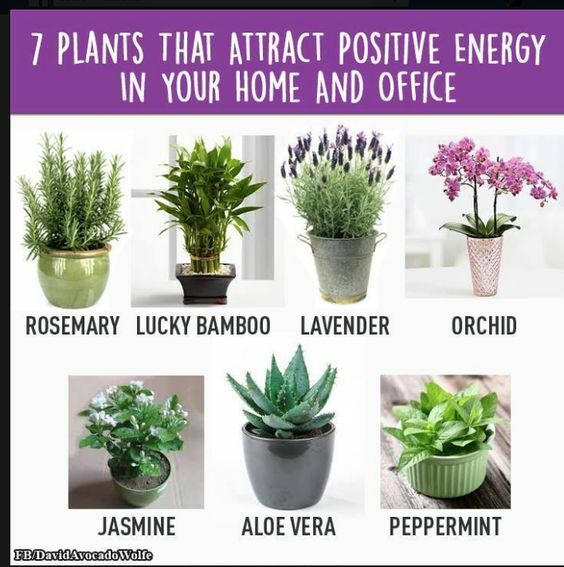 Apart from being good home décor accessories, many plants actually improve the flow of positive energy in the space and give you a sense of well-being every day. 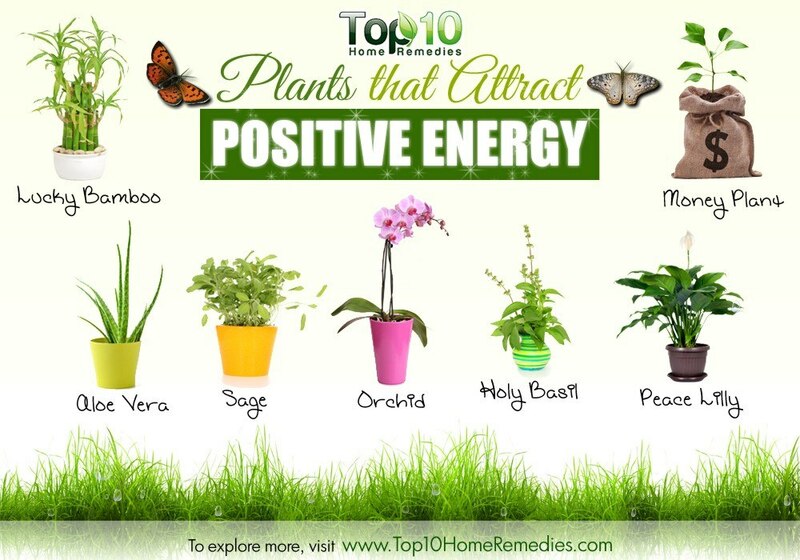 You can reduce the negative energy by adding some specific plants to your home or office. This will not only benefit you but also other people around you. If you wish to bring health, love and luck to your life, lucky bamboo (Dracaena braunii) is one indoor plant that you should have at home. This plant has been used for thousands of years in Asia as a symbol of good fortune and prosperity. According to feng shui, the vertical shape of this tall, green plant represents the element wood. This element influences our life energy, vitality and physical activity. The plant’s stalks resemble bamboo, and the leaves are similar in shape. Lucky bamboo is a very low-maintenance plant. Place it in a corner of a room that has low lighting and away from direct sunlight, preferably the east or southeast corner. Keep it in a glass bowl with about 1 inch of distilled or purified water. 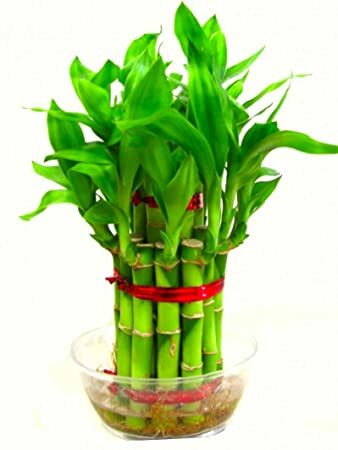 Keep the bamboo stalks to odd numbers as they are considered to be most lucky. Note: As the bamboo plant belongs to the Dracaena family, it is toxic to dogs and cats. Epipremnum aureum is a beautiful plant and also known as golden pothos, hunter’s robe, ivy arum, silver vine and taro vine. According to feng shui, this plant produces a positive energy flow that attracts good luck and fortune. This is why it is recommended to put this plant inside the house rather than in your garden. Plus, it helps purify air polluted with synthetic chemicals from furniture and cleaning solutions. It filters the indoor air and increases oxygen inflow. A perennial, this plant can be grown as either a trailer or a climber. It has heart-shaped leaves, needs little maintenance and is incredibly easy to propagate. Always try to place a money plant in front of a sharp corner or angle. This position helps reduce anxiety and stress as well as negative thoughts. However, avoid placing it in the northeast corner as well as along the north and east walls of your house. It is believed that the plant’s shoot should point upward to bring you wealth and prosperity. This herb contains incredible cleansing qualities and has the ability to help bid adieu to negative vibes. It can be used to get rid of negative emotions, such as anger and fear, from your life. It also promotes the flow of positive energy in your home and office. In North America, there is a tradition called smudging, where people burn white sage bundles to get rid of negative energy. It is believed that when done with the right intent and respect, smudging greatly helps boost positive energy in you and the place around you. A pot of sage by the window will make your house smell great. You can also use the leaves to improve your health, as they contain antibacterial, antifungal, antiseptic, antispasmodic, astringent, carminative, diuretic, hypoglycemic and estrogenic properties. This plant can add splashes of green color to brighten up a dull spot in your house or office. However, do not place it in areas that are very dry or have low humidity. Holy basil, a part of Hindu culture and Ayurvedic medicine, helps clear the air of negative energy and attracts positive vibrations to the environment. Growing a basil plant in one’s home or garden is believed to have a spiritual healing effect on the environment. This benefits the residents of the premises in many ways. It is one of the few plants that emit oxygen 20 hours a day and also absorbs harmful gases like carbon dioxide and carbon monoxide from the environment. You must place this plant in a north, east or northeast area of your home or garden. Holy basil is a powerful antioxidant with antibacterial, antifungal and anti-inflammatory properties that help treat a variety of conditions –from the common cold to bronchitis and from a fever to digestive problems. The plant’s tender leaves are edible. They can be consumed fresh or used to make tea. The leaves can even be used to purify water. This purified water should be sprinkled throughout your home to boost positive energy. 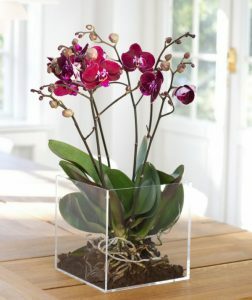 According to feng shui, the orchid is another potted plant that attracts positive energy. It not only improves the energy of the home, but also the lives of the owners themselves – both spiritually and physically. Ancient Greeks associated orchids with fertility and virility, making it a great gift for newly married couples. The long-lasting flowers are beautiful and come in different shapes and sizes to suit different types of interior décor. The sweet and pleasant fragrance of the orchid also uplifts your mood. Orchids not only absorb carbon dioxide, they also release oxygen at night. So, a bedroom is a good place for your orchid. Not just beautiful, they are so easy to take care of! 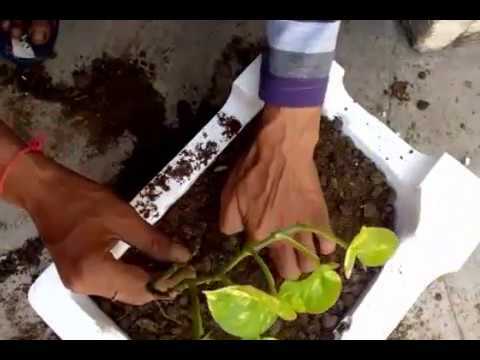 The plants need light soil moisture to survive. As the name says, you got to have this plant in your house. The peace lily is another beautiful flowering plant that can help you prosper spiritually, mentally and physically. The glossy spiked leaves improve the flow of good energy in your home. This plant even purifies air by breaking down and neutralizing harmful indoor gases. It can detox the indoor air of toxins like formaldehyde, benzene and carbon monoxide. Peace lily plants are also super easy to care for. They grow well in shaded or dark environments, hence they make a perfect addition to a basement, a small office and even a corner closet. You can also place them in a bedroom to provide a sense of tranquility and restful sleep. Plus, these deep green plants with gorgeous bright white blooms go with any type of interior décor. I just love this plant in food. It is definitely my favorite herb. Rosemary is good for your physical and mental well-being. It also aids in air purification to keep your home and office free of harmful toxins. Plus, it offers medicinal benefits that have been used since the ancient times to treat several health problems. It smells so incredible that it can instantly lift your mood, reduce fatigue, fight anxiety, improve your memory and treat insomnia and loss of strength. Rosemary also brings inner peace, thus it surely deserves a place in your home. Keep rosemary in a sunny spot and do not over water it. As a bonus, you can use the leaves to make tea whenever you please or especially when you suffer from a headache. You can even place a few sprigs of dried rosemary in cloth bags and place them in several areas of the home to attract positive energy. 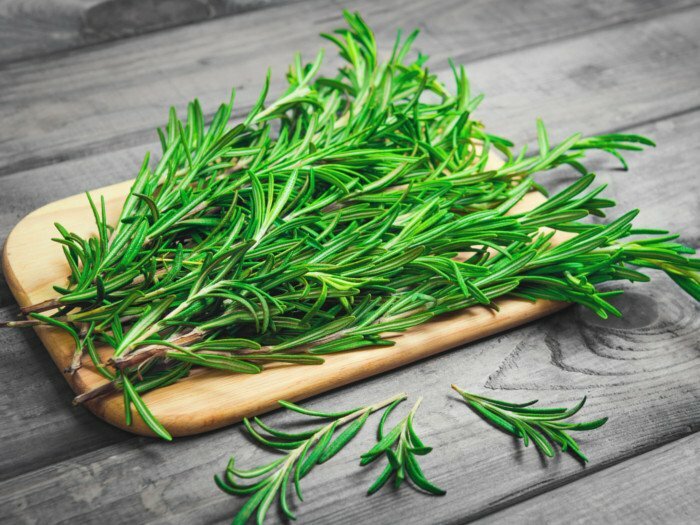 The most interesting health benefits of rosemary include its ability to boost memory, improve mood, treat Alzheimer’s, heal cancer, reduce inflammation, relieve pain, and protect the immune system. The herb also helps stimulate circulation, detoxify the body, protect the body from bacterial infections, prevent premature aging, and heal skin conditions. Fresh rosemary has a very  high reserve of vitamins such as vitamin A, vitamin C, vitamin B6, thiamin, folate, as well as minerals like magnesium, calcium, copper, iron, and manganese. It has abundant antioxidants in its phenolic compounds such as diterpene, carnosol, and rosmarinic acid, as well as in its essential oils such as cineol, camphene, borneol, bornyl acetate, α-terpineol, and α-pinene. The herb has high dietary fiber. It is low in cholesterol and sodium but high in saturated fats. Jasmine, also known as the couple’s plant, attracts positive energy and helps strengthen your relationship and build romance. 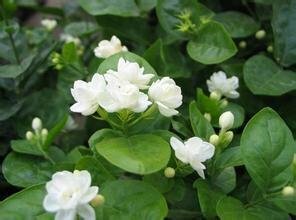 The sweet smell of jasmine helps eliminate negative energy from a room and boosts your confidence and optimism. Additionally, its pleasant smell can help soothe your stressed mind, while providing you with a bit of refreshed energy. It even helps fight issues like mental blockage and sadness. When growing indoors, place this beautiful plant near a south-facing window. You can enjoy it in the bedroom or any other room where you spend the most time with your partner. You can even grow it in your garden and place it in the north, east or northeast area of your garden. The health benefits of jasmine tea include a reduced risk of heart attack, stronger immune system, and prevention of diabetes. It prevents cancer, improves the digestive process, and lowers cholesterol levels. It has also been found to eliminate harmful bacteria and ease chronic inflammation. Jasmine tea is not considered an “herbal tea” because it is actually a normal tea (green, white, black, or oolong) that is flavored with jasmine flowers to create the unique scent and taste. China has a long and famed history with tea, and jasmine is one of the most popular types to emerge from this ancient nation. Jasmine tea first appeared in official records during the Song Dynasty, which ended in the 13thCentury A.D., but at that time, it was mainly reserved for royalty. It may have originally come from Persia, through India, along with the cultural exportation of Buddhism to China. The aloe vera plant is a bearer of good luck and positive energy. The energy it releases can fight off bad luck and vibes. It is a very easy plant to care for, making it a staple in many homes. You can place in indirect sunlight or artificial light and water it regularly. However, remember that this plant cannot tolerate standing water, so proper drainage is a must. Aloe vera will decorate a room with quiet grace, while also doing the duty of a self-regenerating first-aid kit. From minor burns to acne, you can use the gel to treat many common skin problems. It is recommended to place an aloe vera plant in a passageway so that it can absorb the negative energies in your home. You can also put it in your living area or in the area where you greet guests. You can even sow an aloe vera plant in the backyard for economic stability. Aloe Vera has been a miracle plant for quite some time. It’s one of the rare beneficial plants that can you can use both externally and internally. It yields the same results with the same efficiency. This wonderful cactus has been a staple of ancient American medicine for quite some time. It saves many lives by curing many annoying conditions. It’s one of those eternal natural remedies that keep on helping humanity. It helps in battling annoying microbes and other infections, and always has a place in modern medicine. It is independent of the fact that how much technology advances and what point it reaches. Many experts have concluded that aloe vera is, in fact, one of nature’s most powerful herbs. It has an incredible versatility when it comes to tackling diseases. 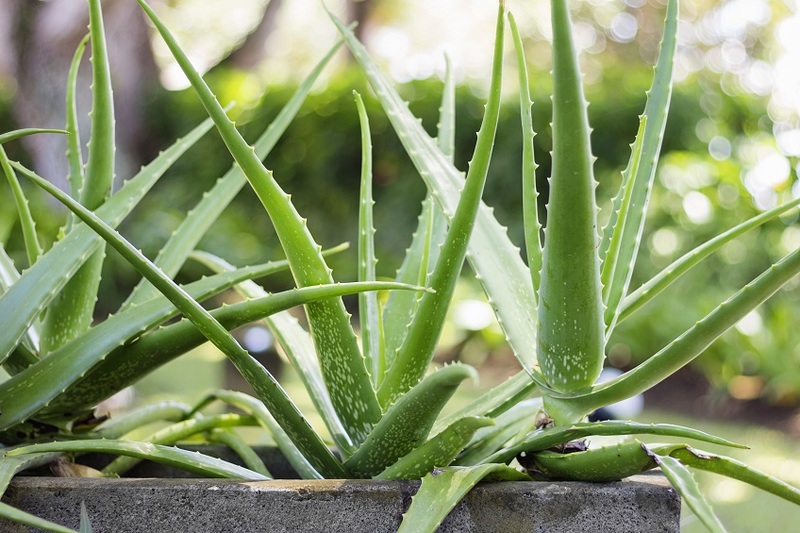 From a plethora of vitamins and plenty of useful minerals, aloe vera has a place in every diet. It can solve any problem. To help everyone understand this often overlooked herb, we’ve decided to compile the ten best health benefits of this magical cactus. From a stronger immune system to better digestion, it seems as if this beneficial plant can do everything. It’s cheap, available and versatile. So there is absolutely nothing stopping you from trying it out. You won’t regret it, and your life will be turned around. 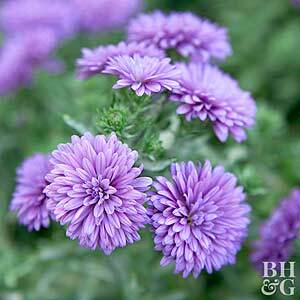 Chrysanthemum also attracts positive vibrations, while keeping away the negative ones. In Buddhism, chrysanthemum represents purity and honesty. In fact, the Chinese and the Japanese believe in the healing power of chrysanthemum. Plus, its strong air-cleaning qualities can help purify the air and remove toxins, such as trichloroethylene, benzene, formaldehyde, ammonia and other chemicals. This plant promotes well-being in the home and also symbolizes long life. Known to promote happiness and good moods, it is recommended to place the plant in areas where constant tension is generated. Known for its beauty, even looking at it can provide a sense of calmness. As the flowers come in different colors, including red, orange, yellow, white and lavender, you can choose one that goes with your home décor. It may be used to equally good effect in the garden or in a window box where it gets indirect sunlight. While this may not be the first variety of tea you think of when you’re looking for a brew, chrysanthemum tea has been around for more than a thousand years, and is believed to have originated in the Song Dynasty in China. Chrysanthemum flowers that are used to make this powerful tea come in a number of varieties, but traditionally, the scientific name of this beneficial  plant is Chrysanthemum indicum. 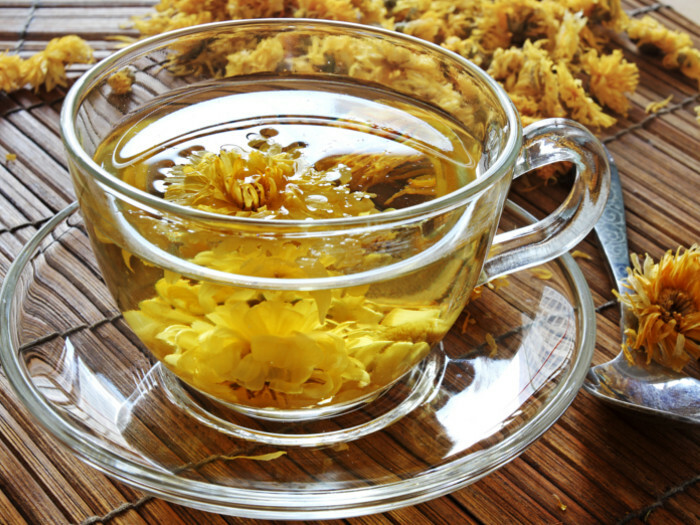 Unlike many other herbal teas, which use only the leaves of a plant in order to brew the beverage, chrysanthemum tea is made by infusing hot water with full flowers, which release a wide variety of antioxidants, organic compounds, vitamins, minerals, amino acids, and soothing chemicals into the mixture, making for a delicious and highly nutritious drink! The tea is traditionally made in China but has since spread around the world and you will know this tea by the floral scent, the flowers steeping in the bottom of the pot, as well as occasional wolfberries or other herbs. There are four main varieties of this tea still prepared and consumed in China, from different species of this flowering plant. The tea’s color is pale to bright yellow, depending on the strength of the tea and how long you’ve steeped the flowers. Its medicinal  uses have been known for centuries, making it highly sought after by natural healers. Many people associate having a cup of tea with relaxing and unwinding after a long day, and chrysanthemum tea is particularly good for this purpose. For generations, this tea variety has helped to lower blood pressure, cool the body, and reduce inflammation, all of which can help to induce calmness. The powerful antioxidants and minerals present in the tea can help your body better regulate itself and eliminate  unnecessary stresshormones in the blood. Nutritionally, peppermint offers vitamins A and C, iron, potassium, fiber, and it’s low-calorie. Its refreshing flavor and cooling sensation lead to its inclusion in many products including mouthwash, toothpaste, soap, and ointment. Regardless if you obtain it from your local farmer’s market or grow it in your own herb garden at home, peppermint leaf offers many amazing health benefits. and some are very important for a better life. So go green in every way. After several weeks of fantastic, warm sunny weather plants where indeed in need of water. I have been watering my plants every second evening for almost all month in may. In the long run it is not good for our drinking resserves, but I just love this kind of sunny warm weather. Perhaps it is the clima changes. We have got the warmest may ever. 14 degrees Celcius average compared to 12 what use to be average for may. You can really feel it when something is good for your body and soul. It is good to have that feeling with many things of course. Life is really about being good to yourself. I have that feeling in many situations. Especially when I am physically active. When I walk, run or am biking in a beautiful nature. When I am at the beach and swimming in the ocean. And of course, what this article is all about, growing things in your own garden. Feeling the “nature” around you in your own garden, cooperate with it, form it and grow fruits, vegetables, herbs and flowers that is just a magnificant and healthy feeling for body and soul. Biodynamic Nonprocessed food is the future and the very best food you can get. I am not a vegetarian, but I really try to eat more and more plants and less meat and I can feel it is the right thing to do for my body and my wisdom according to sustainability. I am making a new experience in my garden. I have recently made my own greenhouse and are growing three different kinds of crops. The health benefits of beets include treatment of anemia, indigestion, constipation, piles, kidney disorders, dandruff, gallbladder disorders, cancer, and heart diseases. They also help prevent macular degeneration, improve blood circulation, aid in skin care, prevent cataracts, and treat respiratory problems. These benefits of beetroots can be attributed to their richness in nutrients, vitamins, and minerals. Beets or beetroots, as they are often called, belong to the Chenopodiaceae family. Beetroots are one of the varieties of the Beta vulgaris species. Their history stretches back to ancient times, and the earliest signs of their cultivation were approximately 4,000 years ago in the Mediterranean region. From there, they were probably transported to Babylon, and by the 9th century AD, they had made their way into the Chinese culture and cuisine. They have long been associated with sexuality and have been used as an aphrodisiac for thousands of years. Beetroots are frequently added as an ingredient to salads, soups, and pickles and are also used as a natural coloring agent. Even though beets are available throughout the year, they are still considered seasonal vegetables. Besides their use as an actual food item, beets are valuable as a source of sucrose, which makes them a viable replacement for tropical sugar cane. They are frequently used to make refined sugar. Beets have a wide range of health benefits because of their nutritional content, including vitamins, minerals, and organic compounds like carotenoids, lutein/zeaxanthin, glycine, betaine, dietary fiber, vitamin C, magnesium, iron, copper, and phosphorus, while also being a source of beneficial flavonoids called anthocyanins. They are very low in calories, with no cholesterol, but they do have the highest sugar content of all vegetables. Beet fiber helps reduce cholesterol and triglycerides by increasing the level of good HDL cholesterol. Having a high level of triglycerides increases the risk for heart-related problems, so an increased HDL cholesterol is a good line of defense against that. The presence of the nutrient betaine lowers the levels of homocysteine in the body which can also be harmful to the blood vessels. Thus, consumption of beetroot helps prevent cardiovascular diseases in multiple ways, so conditions like atherosclerosis, heart attacks, and stroke are less likely to develop. The fiber in beets also works to strip excess LDL cholesterol from the walls and helps eliminate it from the body quickly. Beetroot is a source of vitamin C that helps prevent asthma symptoms. The natural beta-carotene in beetroot also helps to prevent lung cancer. Vitamin C is a powerful antioxidant that boosts the immune system in a number of ways. Besides acting as an antioxidant itself and defending against the effects of free radicals in the body, it also stimulates the activity of white blood cells, which are the body’s main line of defense against foreign bodies, as well as viral, bacterial, fungal, and protozoan toxins that can result in a multitude of infections and illnesses. The presence of beta-carotene, which is a form of vitamin A, helps prevent age-related blindness called cataracts as well as a reduction in macular degeneration that commonly occurs as we get older. Vitamin A is considered a powerful antioxidant substance that is involved in many essential activities of the body. The flavonoids and vitamin C in beets help support the structure ofcapillaries. Beets have been considered an aphrodisiac or sexual booster for millennia. Part of this stems from the fact that beets contain significant levels of the mineral boron, which has been shown to boost the production of sexual hormones. This can lead to a boost in your libido, increased fertility, sperm mobility improvement, and a reduction in frigidity in the bedroom. Your sexual life can get a legitimate and time-tested push in the right direction by adding beets to your diet. Beets contain a significant amount of carbohydrates that provide energy for prolonged sports activities. Carbohydrates are the natural building blocks of energy metabolism, and beets provide them without any of the negative side effects of many other carbohydrate-heavy foods. When the body has a sufficient amount of carbohydrates, it is able to fuel all of the necessary functions as well, including the important metabolic reactions that keep the organs functioning efficiently. In a related function, researchers have noticed that oxygen uptake is greatly increased by people who drinkbeet juice due to the high nitrate content. The results show that oxygen uptake increases by up to 16%, which is an unheard of boost and is actually more than a normal person can improve by, even when training extensively. This increases stamina for exercising and participating in sports, making beet juice an interesting sports drink that most people would never consider. The beta-carotene present in beetroot aids in reducing or slowing macular degeneration in the eyes. Macular degeneration is often associated with an increase in free radicals, which drastically affect the premature aging process of many people. Beta-carotene is a powerful form of vitamin A, which has antioxidant capabilities and defends the eyes against the damaging effects of free radicals. A deficiency of potassium in the body increases the risk of stroke. Therefore, potassium-rich beetroot is recommended to improve heart health for that reason as well. Potassium is a vasodilator, meaning that it relaxes the blood vessels and reduces blood pressure throughout the body. When blood pressure is reduced and the vessels and arteries are no longer contracted, blood clots are far less likely to form or get stuck, and the plaque that may have built up along the walls of your blood vessels will not accumulate to form additional clots. Clots are what eventually lead to heart attack and stroke, so beets and their potassium content are quite a health booster! In ancient times, beets were used to cure fever and constipation. In the Middle Age, beetroots were also used as a remedy for digestive disorders. Finally, beet leaves are good for speeding up the healing process of wounds. Word of Caution: Beets contain oxalates, which when consumed in excess can cause bodily fluids to crystallize. People with kidney or gallbladder problems should avoid beetroots because they could exacerbate kidney and bladder stones. I have always wanted a greenhouse, where you can grow all kinds of vegestables, herbs and fruits. Many trees have to be cut and a lot of diging ahead. Making almost everything from the trees to fire woods. Beginning to dig up the roots. Enough work for the following days…. That is good exercise too.